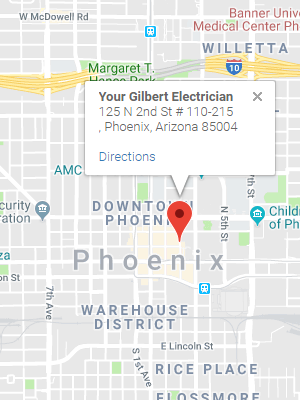 When our Gilbert licensed electricians begin electrical troubleshooting and repair, we want to take care of the electrical problem and repair in the best way possible. We all rely on the unseen working electrical system, ventilation, heating and cooling to provide safety and comfort for your Gilbert home or business. With today’s high tech world, numerous home offices, people working remotely and business and industry relying so heavily on technology, it is essential to know who to contact and trust for quality electrical troubleshooting and repair needs. There’s never a good time for an electrical problem. Electrical issues seem to happen at the most inconvenient times. We provide electrical troubleshooting and repair for those inconvenient times when your lights aren’t working, a breaker keeps tripping, or an outlet is dead. Our electrical troubleshooting and repair team has a system which is reliable and useful as our team solves electrical problems throughout the Gilbert AZ area. Our experienced Gilbert electricians will arrive ready to begin and prepared to troubleshoot. They drive vehicles which are equipped with a variety of tools. This helps them be prepared to efficiently and effectively troubleshoot, inspect and repair any electrical problem which they locate at your Gilbert AZ residential or commercial facility. Contact us today for your quality electrical troubleshooting and repair needs. We will find the root of your electrical issue and get it safely repaired, so you are up and running again. Our licensed Gilbert electricians have performed repairs on numerous residential and commercial electrical systems. We are experienced with electrical troubleshooting and repairs. Our electricians have safely repaired many electric switches, plugs (outlets and receptacles), lighting, wiring, and connections for residential and commercial structures. Our trained electricians will safely troubleshoot and repair all of your Gilbert AZ electrical situations.